Naurato: Chance vs. choice - how will you handle your season? Naurato: Chance vs. choice – how will you handle your season? Every day that you wake up in the morning you have a choice – the opportunity to choose your attitude for the day. Yes, there is a chance that the weather outside is horrible or that traffic on the way to school is backed up and you may be late for your first hour class. But you have a choice on how you react to each individual chance. All of these little choices are bundled up to dictate the future success that you will have for the rest of your life. The 2015-2016 season is underway! This is a time for you to feel confident in your ability on the ice through the workload that you put into your off-ice training and on-ice skill development throughout the past four months. You are excited to see old teammates as well as build some new friendships through team-building events and rigorous training camps at the start of the season. Coaches are making decisions on how each individual player will help have an impact on their respective teams this season. Everyone has a role and I’m sure there are a lot of players out there that are happy with where they fit in on the team and there are even more players questioning their position in the lineup. 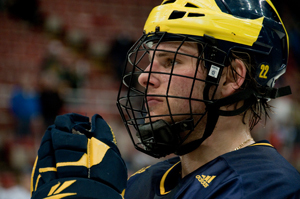 Brandon Naurato is the director of the Total Package Hockey Center of Excellence in Canton, Mich. Click the image for more information about this year-round hockey school. Is it choice or chance that you are in this situation? Now is a better time than ever to start this season off on the right track by choosing to become the best teammate you can be. This choice will be contagious to the rest of the team when they see the individual character that you bring to the rink every single day, which will help build the overall culture of the team and help create individual success. Character is the sum of our choices and culture is the sum of our character! Today is the day to make the choice to be a leader this upcoming season. Choose to represent your team and yourself in the best light possible, influence others in a positive way, and lead by example. Successful teams are made up of passionate like-minded individuals that know their role and are bought into the process that helps put the team first. This is done by each individual buying in, sacrificing for each other and caring for one another. I am challenging you with the understanding that every action, and every behavior, from every player, each and every day is a choice and it equals a choice culture. Will you leave this season to chance or to choice?